Welcome. This newsletter we have a quick report on the Shannons Wheels 2004, a reminder about the Victorian Mercedes-Benz Club Concours next weekend, some important info for 60's model owners, and the usual line up of jokes and interesting cars. Wheels has now been and gone for another year and once again it was a great success. The weather looked like it was going to put a damper on the proceedings but held off long enough for the show to go on. Whilst numbers were down on last year, the quality certainly was not. If you look here you will find a list of the pictures I took on the day. The picture above is of the W107 line up. The 450SLC in the front is my everyday car at the moment. Any ideas what Mercedes-Benz model this picture is from?? Or maybe it is a shot taken inside the Space Shuttle? If you think you know what car this is from, send me an e-mail. 240D sedan 1981, 4 speed manual transmission, good engine but with very rusty body. 280E sedan 1981, same thing, good mechanicals but with a very poor body. Talking about W123's we still have the very good blue cloth interior from a 1983 230E. It was taken out of the car this last week and the first one in with $400.00 can have it! One week to go! We will have a trade stand at the Concours and would invite all our Newsletter readers to come along and say hello. 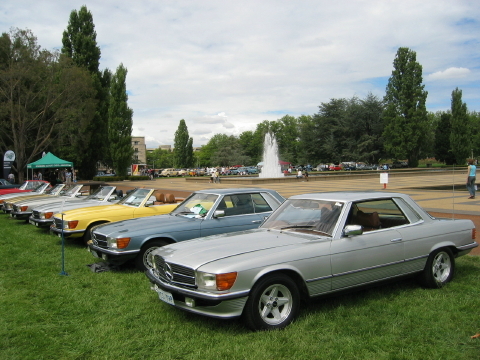 The Mercedes-Benz Club of Victoria will once again be holding their annual Concours d'Elegance on Sunday 14th March in conjunction with the AOMC British and European Motor Show. Contact Brian Billing on 0409 501 677 for more information. You can download the application form here (180k), and the rules are here (150k). This is certainly one of the major highlights on the Mercedes-Benz calendar for the year and should not be missed by any keen Mercedes-Benz fanatic. If you check out our Newsletter number 59 you can see the report from last years event. This year promises to be just as good. The problem is with the front suspension. 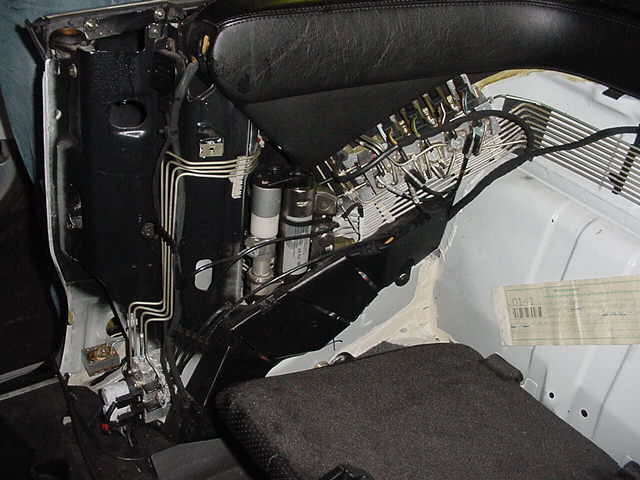 When you lift the car with the front wheels hanging in space the entire weight of the engine/transmission and front suspension is supported by the front subframe mounts (sometimes called tower mounts), the front shocks and the flat spring at the front of the cross member. The pressure this puts on the subframe mounts can tear the rubber away from the steel with the result being that almost all the weight winds up being put on the shocks. ever lift a Fintail on a two post hoist they get a rather firm kick in the #$%. radiator cowling. I know a guy who did this and then started the car. End result was that the cowling broke and piece went into the radiator! jobs like say brake pads. Also just to confuse the situation you can lift these on a two post hoist if the subframe mounts are OK. ,But in most cases the "old" mounts are fine until somebody lifts the car on a two post hoist. ,Due to the design of the mount (two cones with rubber in-between them) they don't tend to self destruct unless they have some pressure put on them. So you are just better off not using a two post hoist! Bit short of links this week, if any of you have some good ones please send them in! Heaps of action in the car sales department this time! Firstly, we have four new cars for sale. These include what must be the best 280SE 3.5 sedan in Australia. The car belonged to a collector who used it as his everyday car for the last 17 years. It has been fully restored over the 17 years and maintained with absolutely no expense spared. The car has won a heap of Concours trophies and comes with a huge inventory of new parts including a set of fully restored headlamps and a new grille. If you are interested in this car give me a ring on 0419 295 458 and I will give you more details. We also have a 1996 C200 Classic with a rare 5 speed manual transmission, a very neat 280E that is so good it has Concours potential and a 320E. The 1986 230E has been sold.